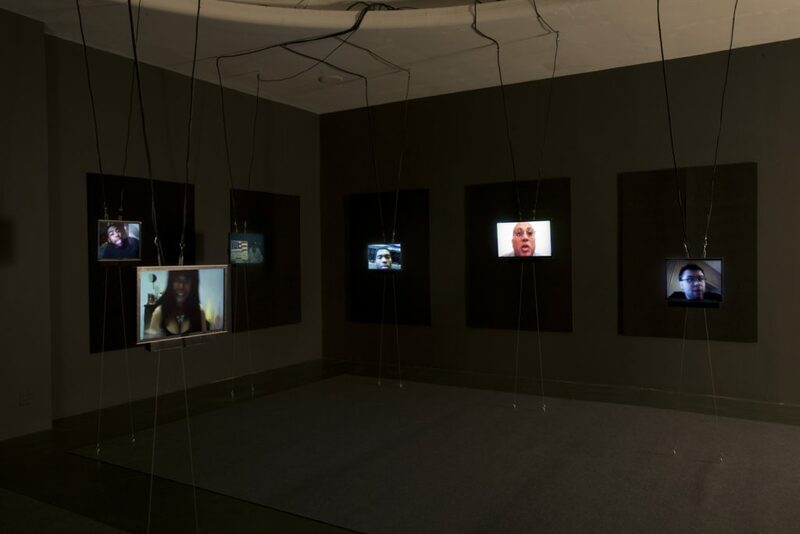 In 2012 LACE commissioned Natalie Bookchin to produce a new work titled Now he’s out in public and everyone can see, an 18-channel video installation that weaves together found fragments from online video diaries in which vloggers recount a series of media scandals involving African American men. The multiple stories, originally shared via viral circulation and inflamed by media networks, participated in a dialogue surrounding themes of racial and class identity while exploring popular attitudes, anxieties, and conflicts related to the perception and construction of race. 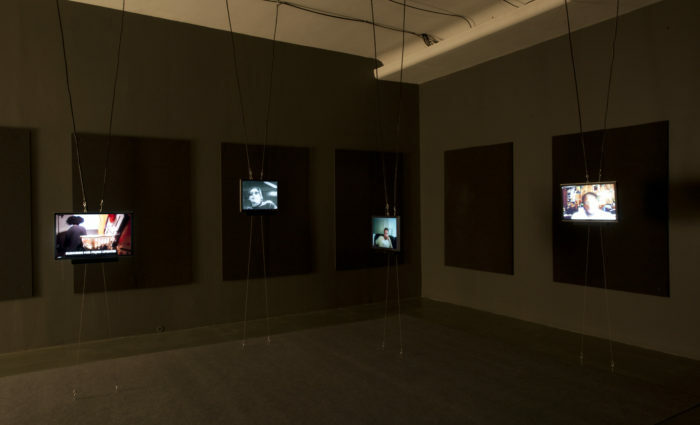 The montage produced by the multiple monitors in the gallery mirrored the composite story of a racialized subject under scrutiny. 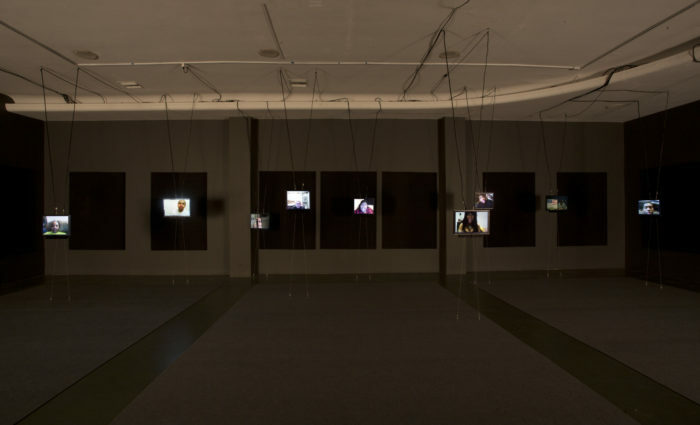 Where the typical viewer of online video is a single person in front of her screen, the installation produced an active social space wherein multiple viewers navigated through a physical media environment, piecing together a fragmented and layered narrative told across space and time. Now he’s out in public and everyone can see was developed over the course of two and a half years and is indicative of a large body of work in which Bookchin re-purposes videos made and circulated online, thereby giving new social context, shape, and form to individual expressions. Previous video works in this series also addressed current social events and phenomena including joblessness, mood-stabilizing drugs, and DIY dance videos. Bookchin’s Now he’s out in public and everyone can see is spatially and conceptually complex, weaving together many videos, sounds, voices, narratives, and perspectives into a three-dimensional space. This evolution of form reflects and explores the multitude of struggles and conflicts in contention within the stories we as a society today construct about who we are, what we aspire to be, and how we represent our selves. Natalie Bookchin’s work addresses the ramifications of mass connectivity and the digitization of daily life and its milieu. 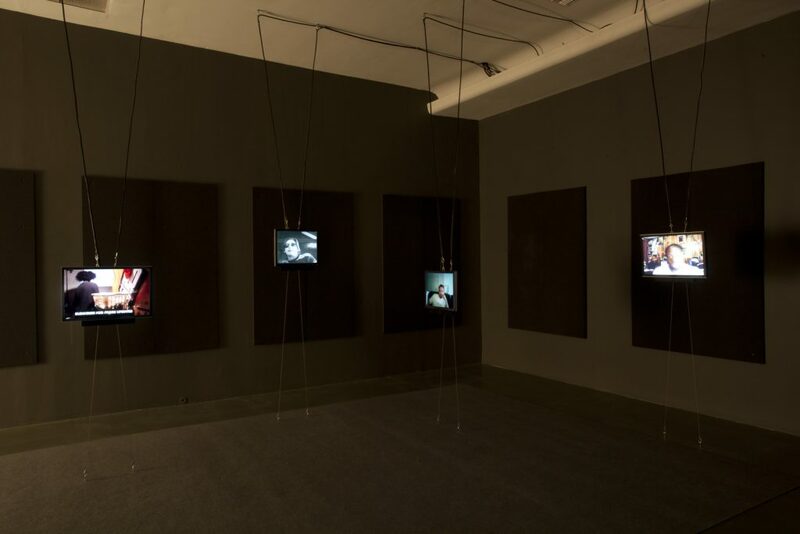 Her multi-channel video installations sift through expanding digital databases comprised of the shared stories, rants, confessions, and gestures that travel, multiply, and flood global networks. These installations challenge the viewer and attempt to make meaning and sense of seemingly random data and disparate individual parts. By visualizing the constant fluxuation of identities and narratives performed online, Bookchin’s installations uncover repeated language and tropes constructed in makeshift cultural artifacts and provisional self-portraits. These artifacts reveal tensions between the collective and the individual, as well as the homemade and the mass produced. In an era of over-produced digitally enhanced images, Bookchin’s work finds beauty and paradox in the found digital DIY image with its clumsy imperfections and traces of the human touch. Natalie Bookchin is current a serving as a faculty member of the Photography and Media Program at CalArts in Los Angeles, CA. Her work has been featured and exhibited in many gallery, museum, and cultural intuitions including: LACMA, MOCA, Los Angeles Contemporary Exhibitions, and others. Bookchin’s is the recipient of numerous grants and awards from various institutions, foundations, and fellowships including: The Durfee Foundation, the California Arts Council, the MacArthur Foundation, and others. To learn more about Natalie Bookchin’s work, visit www.bookchin.net. Support for Now he’s out in public and everyone can see has been generously provided by the James Irvine Foundation and the Andy Warhol Foundation for the Visual Arts.